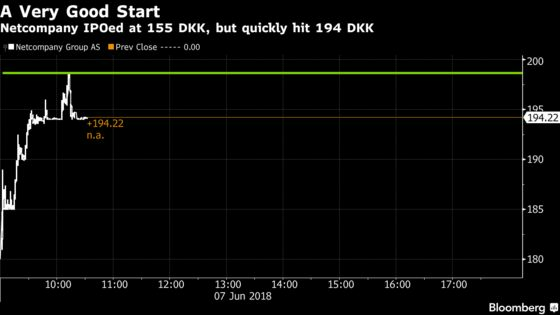 (Bloomberg) -- A Danish tech company that went public on Thursday quickly soared far above the price that initial investors agreed to pay for the stock. Netcompany A/S, which says it wants to be a key player in helping northern Europe go digital, sold shares in an initial public offering for 155 kroner a piece, according to a pre-market announcement. When trading started, the Copenhagen-based firm shot up 25 percent, leaving it with a market value of more than $1.5 billion. Netcompany shares were sold by various funds under FSN Capital as well as key employees, including co-founder and Chief Executive Officer Andre Rogaczewski. The target price had initially been set as low as 135 kroner, with 165 kroner seen as the upper end of the range. Danske Bank A/S, Deutsche Bank AG, and Morgan Stanley & Co. International plc acted as joint global coordinators and joint bookrunners. SEB AB was joint bookrunner. Nets went public at 150 kroner a share, but fell in subsequent months to around 110 kroner until takeover speculation boosted its price again. The payments company has since been bought out by U.S. private equity firm Hellman & Friedman.